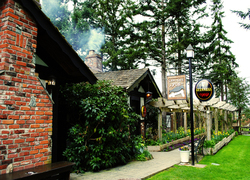 The Crow & Gate Pub opened in 1972, as the first Neighbourhood Pub in British Columbia. Customers come from far and wide to sample the delights of this genuine British style Pub along with superb food, beer and hospitality. It’s pleasantly off the beaten path. Once you arrive you are greeted by a flower filled English garden, beautiful pond, flowers, and lots of tables and chairs outside.